Low-key, youthful luxury, with neutral colours occasionally shaken up by injections of the classic Hermès orange. The French house is renowned for its prints, but they were almost entirely absent from last season’s black on black collection, save for a modest pinstripe. For SS15 Véronique Nichanian presented a line bursting with them, from floral and paisley to abstract watercolour and digital glitch. 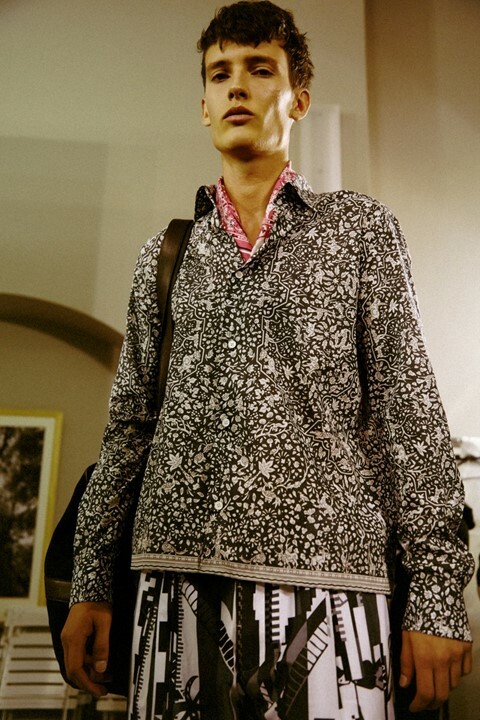 Despite almost always appearing together in the same outfit – patterned shirts were paired with printed trousers, then layered with a graphic jacket – looks remained understated rather than chaotic, a tribute to the expert design. With white slip-on skate shoes, sandals and leather cuffs. Updated silk bandanas were worn around the neck, in a new take on a classic print.